On Wednesday this week (10th September) the Parliamentary Administration Select Committee (PASC) are discussing two reports by the Parliamentary and Health Service Ombudsman (PHSO). The reports are about supervision in maternity services, particularly the way in which supervisory systems should work to investigate and learn from serious incidents in maternity and the second report, about the awareness, recognition and treatment of sepsis across the health system. Both of these issues are of significant importance and have the potential to save lives in the NHS. However, I also believe important lessons need to be learned about the way the Ombudsman themselves have responded to complaints about these important issues. In 2008, a number of Serious Untoward Incidents occurred at the maternity unit at Furness General Hospital (FGH), one of these was the death of my son, Joshua. Following Joshua’s death, the simple truth is that a proper robust investigation into what happened was not undertaken by the Trust. The midwifery supervisory system also failed to properly investigate Joshua’s death. In the months following, I learned of other families who appeared to have had similar experiences; having lost children or partners in tragic and avoidable circumstances at the same, small maternity unit. 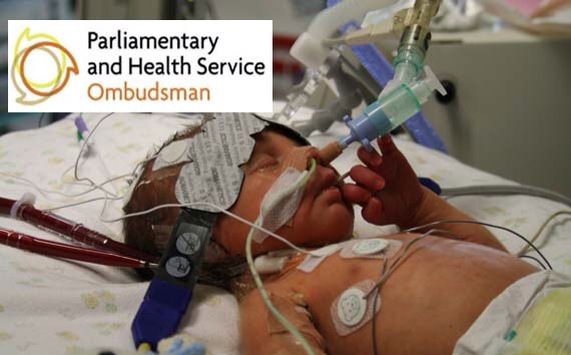 At the time, the Coroner had refused to open an inquest and so we turned to the Parliamentary and Health Service Ombudsman (PHSO) in order to take our complaint and concerns about the safety of the maternity unit forward. At the time, we were warned by others not to expect much from PHSO, but nothing could have prepared us for how this organisation responded to our family. Over the next several months, we were put through an agonising process of waiting for the PHSO to make a decision on whether or not to investigate. It seemed inconceivable to us that they wouldn’t; the fact that Joshua’s death had not been investigated was clear (this is acknowledged in the Ombudsman’s own records). In fact, the case officer assigned to the case recommended an investigation should be undertaken. It wasn’t however. Instead we were told that an investigation would be ‘unlikely to result in a worthwhile outcome’ and that the fact that critical records of Joshua’s care had ‘gone missing’ meant that an investigation would be unlikely to resolve our outstanding questions about what happened to Joshua and why. (Reasons we strongly feel should have supported the need for an investigation rather than counting against us). Part of our complaint about Joshua’s case involved the response to what happened by the Local Supervisory Authority (LSA). When any serious incident occurs in maternity services, the supervisory system (under the remit of the LSA) should ensure that a proper investigation is undertaken by a specially designated midwife. The process should ensure that what went wrong was properly reviewed, understood and any remedial action (training, support or if necessary disciplinary procedures or referral to the NMC) was properly actioned. The overriding purpose of the supervisory system is to ‘protect mothers and babies’. Following Joshua’s death, the supervisory system failed to do this. The final decision letter, which was sent to us in February 2010, defended the supervisory investigation into Joshua’s death and we were advised to pursue our concerns locally (via the North West Strategic Health Authority who were responsible for the LSA at the time). This we did, but unsatisfied with the response, we contacted the Ombudsman again later in 2010. On 2nd June 2011, the PHSO confirmed a refusal to investigate our complaint about the midwifery investigation stating ‘…PHSO had not seen indications of maladministration in the manner in which the SHA had discharged its duties’. I asked for a review of the decision, which again resulted in a refusal to investigate the complaint; this time the Ombudsman argued that the Coroner (by this time we had finally secured the opening of an inquest), the NMC and the CQC were ‘better placed to establish failings and oversee the follow-up’. In March 2012, I decided that the decision take by the PHSO was so unreasonable and dangerous, that I would challenge it via a Judicial Review. I could not afford any legal help, but I researched the Judicial Review system online and wrote a ‘letter before claim’ myself, setting out the evidence and reasons why I felt the decision was flawed. In response to my letter before claim, a second external review was undertaken. This was completed in April 2012 and concluded that the reasons Ann Abraham gave for declining my original complaint for investigation were ‘flawed’ and recommended that a fresh assessment for investigation was made. The full external review can be downloaded here. I strongly recommend you read it. The case was eventually reconsidered and the decision not to investigate was overturned. Only then did the Ombudsman investigate the issues and concerns about midwifery supervision which I first raised in 2009. It follows therefore that the lives of Mothers and Babies have also been put at risk because of the almost 5 year delay by the Ombudsman to properly investigate the concerns. The second report relates to sepsis. The PHSO have recently tweeted ‘Our sepsis report Time to Act said not enough was being done to save the lives of people with sepsis. A year on more needs to be done.’ I agree completely, this is a highly important matter. There are a few things to say though. My son Joshua died as a consequence of a failure to recognise and treat his sepsis in 2008. At the time, the Ombudsman told us that an investigation into his death would be ‘unlikely to result in a worthwhile outcome’ and refused to investigate. Here are just two examples of tragic and unnecessary child deaths from sepsis which were referred to the Ombudsman for investigation. In Joshua’s case, despite the Ombudsman knowing that that his death had not properly been investigated (a fact not disputed), we were told an investigation wouldn’t be ‘worthwhile’. This is a decision that has caused our family huge distress and delayed meaningful lessons from Joshua’s short life being taken sooner. In Joshua’s case, ‘significant risks’ to mothers and babies continued at the maternity unit where he was born years after his death. It is clear that a proper investigation at the time might have made a difference to this situation by alerting others in the system as to the true extent of the failures that resulted in his death. This is something that the current Ombudsman vigorously refutes, despite refusing to allow any kind of external review of the decision or concerns. In Sam’s case, it took two years for the Ombudsman to report and failures in the process of investigation added considerably to the families distress. The Parliamentary Administration Select Committee (PASC) are right to debate these two important issues but there is also a desperate need for a proper open debate to be held about the functioning of the PHSO itself. How can it be right that Wednesday’s discussion was prompted by a PHSO report that was completed almost 5 years after the initial complaint was made? Furthermore, if a complaint which has resulted in such fundamental recommendations for change was rejected for investigation twice by the PHSO, how many other legitimate cases were also thrown out? Can this question be ignored? My message to the PASC is this; on Wednesday, please remember the struggle families behind the reports being discussed have had to have their concerns addressed. The reason this didn’t happened sooner wasn’t because the people involved weren’t shouting loudly enough – their voices were heard but those listening chose not to act. In recent years, I believe that massive progress has been made in relation to patient safety. The Francis report laid bare the scale of the challenge ahead; this government have started an important journey towards a safer NHS, but no one is under any illusion that there is still along way to go. Now is surely the time to shine a light on the Ombudsman service, truly learn the lessons from the past and ensure that in the future, we have a fit for purpose Ombudsman’s service that acts in the interests of people who come to them needing answers and wanting to ensure lessons are learned from the often tragic circumstances they have already endured. The NHS needs an Ombudsman service that is capable of investigating serious NHS failures thoroughly and within a reasonable timescale; where patient safety is the priority (not for example whether or not the family may be considering future legal action). The NHS needs an Ombudsman that applies the same principles of openness, independence and transparency it expects services within its jurisdiction to adhere to, to all aspects of its own operation, including complaints about itself. As a wise person once said, ‘the first step to solving any problem is admitting it exists’. This entry was posted in Uncategorized on September 8, 2014 by patientsafetyfirst.